Tom Carroll "1999 Surf Champion"
Born in Australia, Tom Carroll grew up on the wave-rich Northern beaches of Sydney where the goofy-foot developed a radical style of power surfing. At age 15 he won the world's inaugural Pro Junior Championships. 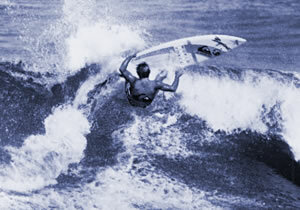 Sidelined by reconstructive knee surgery he bounced back to win the ASP World Championships in 1983 and 1984/85, then the Pipe Masters in 1987, 1991 and 1992.